Nifty opened strong around 6105, but corrected down to the lows of the day around 6046. The responsive buyers took control from thereon and move the index back above 6100 level but closed just short of it at 6096.20, still a huge gain of 75.25 points. On a week-on-week basis the index gained huge 188.90 points or approx 3.2%. The broader market was just positive, with 716 advances to 621 declines. Not much overhead resistance above 6100CE. 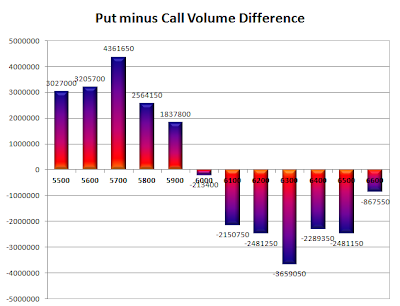 Call option 6200-6600 added 19.16 lacs huge amount of OI with short covering seen at 6100 and below strike prices. Put option 6300-5900 added 22.06 lacs huge amount of OI with profit booking seen at 5800 and lower strike prices. 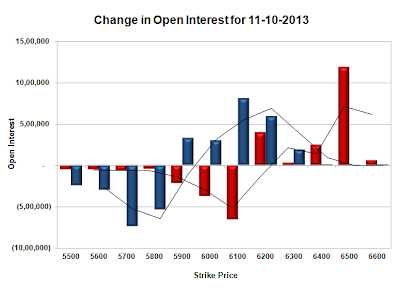 Nifty Open Interest is at 1,78,30,500 up by huge 9,71,800, with increase in price, most probably huge long build-up. Bank Nifty Open Interest is at 20,19,575 up by huge 1,84,000, with increase in price, most probably huge long build-up. FII’s bought huge 17.13 lacs Futures, mostly long build-up, as their net OI increased by 35775 contracts (includes 94667 longs and 60402 shorts) and the average price per contract comes to around 6010.98. FII’s future open contract as on date is 449470. PCR Open Interest (Volume) is at 1.300. Initial support at 6000, with OI of 34.15 lacs, below that at 5900, with huge OI of 41.80 lacs. 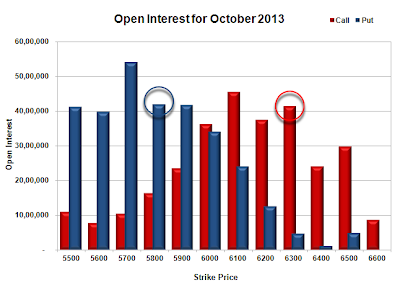 Initial resistance now at 6200, with OI of 37.48 lacs, above that at 6300 with OI of 41.37 lacs. Day Range as per Option Table is 6015 - 6157 and as per VIX is 6021 - 6171 with 6083 as the Pivot.